Patrice Warrener enjoys international renown, notably for having created the Chromolithe polychromatic illumination system used to highlight the architectural details of a building, creating brightly-coloured frescoes. In 2003, he lit up the Porte d'Aix in Marseille, before going on to create displays at Gouda City Hall in the Netherlands and York Cathedral in the UK. 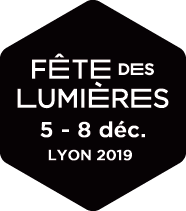 For the 2006 Festival of Lights, he was asked to design a light show for the inside courtyards of the Hôtel de Ville, creating his Traversée Contemplative display and starting his exploration of the Festival's most famous sites. For his 4th contribution to the Festival in 2008, he told the story of the "Visit of the Kings" on the facade of St John's Cathedral. In 2010, the chosen site was the Place des Terreaux, which featured his trademark bright colours and horses galloping around the three facades of the square in his Hommage à Bartholdi, Place à la Fontaine, showcasing the fountain designed by Bartholdi, which was transformed into a shimmering jewel. Patrice Warrener is taking a nostalgic look back at his first participation in the Festival of Lights twenty (light) years ago when he explored the architectural details of the Célestins theatre and the surrounding square in coloured light. Now, he has taken the opportunity to recreate and enhance his original installation, harnessing new technology to embellish the building’s distinctive features. "Fontaine d'Etoiles" is a light show with sound design that pays tribute to all forms of art. A dozen high-definition polychrome tableaux are shown on the fountain, one after another, to highlight the four statues by artists Audran, Coustou, Delorme and Flandrin. Like a museum, the visual effects and light transitions invite you to a moment of contemplation in a magical setting. With the support of Carrefour. The famous sculpture of horses in harness by the sculptor of the Statue of Liberty becomes a carousel of shade, light and colour, with the horses turning into dragons, chimeras, zebras and other luminous mythical and fantastical creatures. The sculpture, enhanced with constantly changing dazzling colours, is shown in a new light, magnified by a backdrop which isolates it from the buildings in the background.